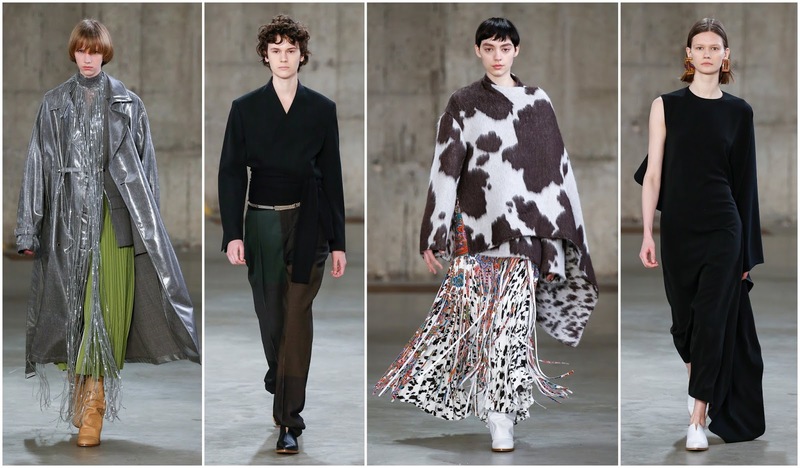 The show notes at Ports1961’s show at London Fashion Week in February spoke about “a different journey, a fresh terrain. A new tribe.” Perhaps they were thinking about the Philophiles—those stalwarts who worshipped Phoebe Philo’s clothing for Céline. It’s been open season at fashion week to entice that customer, with many designers investigating how to piece together a seemingly impossible puzzle. The intent was made clear when oversized scarves were emblazoned with ‘Made in England’ and ‘Made in Italy’ in jacquard patterns and prints; the design team and production is based in England and fabrics are sourced in Italy; she deployed finely-woven Japanese wool. The body of outerwear was dedicated to the sheer act of braving the fickle British weather. As is the case with much of fashion collection nowadays, Cagalj factored in climactic variances. There were waterproof coats with flowing sequin details, inspired by rain showers—a creative but literal take on weather conditions. There were some lighter options in the effortless, loose proportions of day dresses, an option for temperate climates. It is as much a wise business manoeuvre to court these variety of groups as it is practical to serve the ever-changing weathers. The menswear influences are strong with an emphasis placed on the role of masculine tropes in a women’s wardrobe. Cagalj is a self-proclaimed lover of men’s fashion, stating it is one of her primary influences. It appeared in the form of accessories with the debut of their new accessories line; the shoes are described as “mannish” There was bold-shouldered suiting and masculine tailoring running throughout the collection. They juxtaposed nicely with the subtle femininity of the formless dresses and cashmere capes. It was an austere but gestural vision of womanhood and the multiplicities of who she might be and where she could be from.